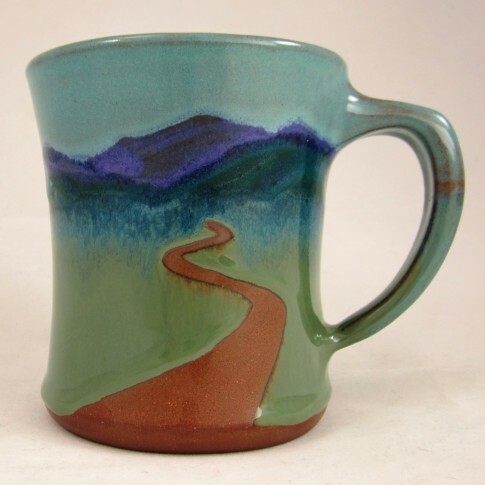 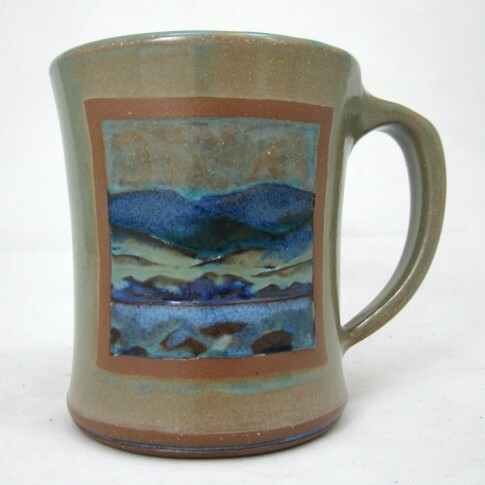 The pottery on display here is all created in my home studio in the beautiful Green Mountains of the Northeast Kingdom of Vermont. 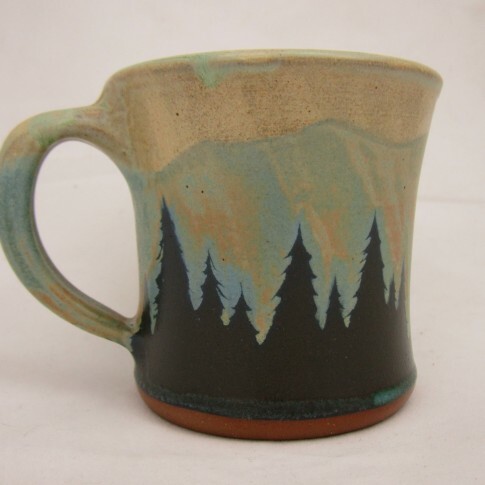 My natural environment continually inspires me, and I strive to capture the spirit of the landscape that surrounds me and bring it down to the realm of daily life by making functional pottery. 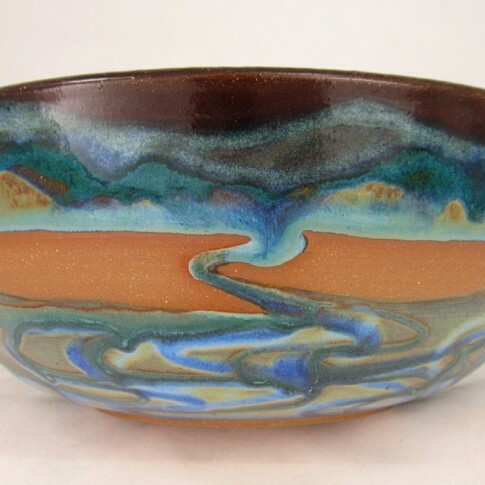 Clay allows me to intermingle with the forces of nature – earth, water, fire, and air – and to make a useful product, which is also a piece of art. 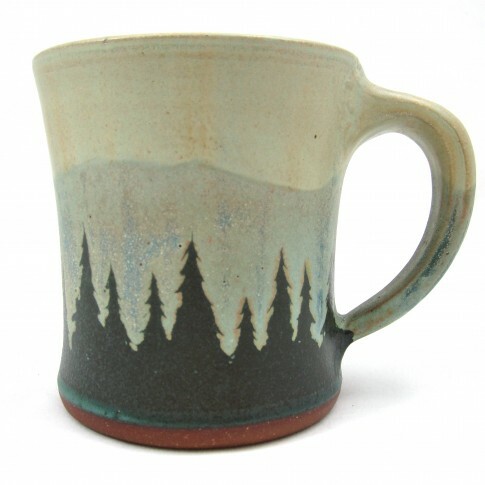 Inspired by the changing light and seasonal illuminations of the northern mountains. 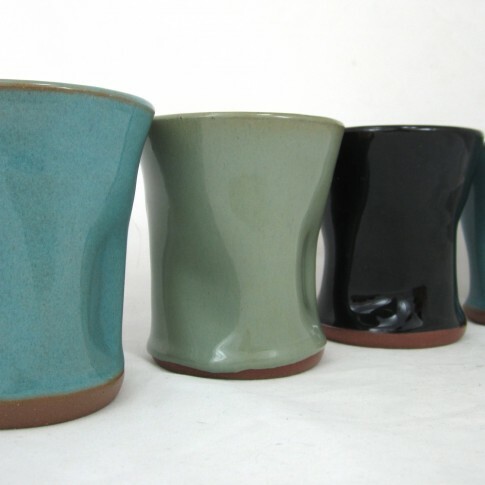 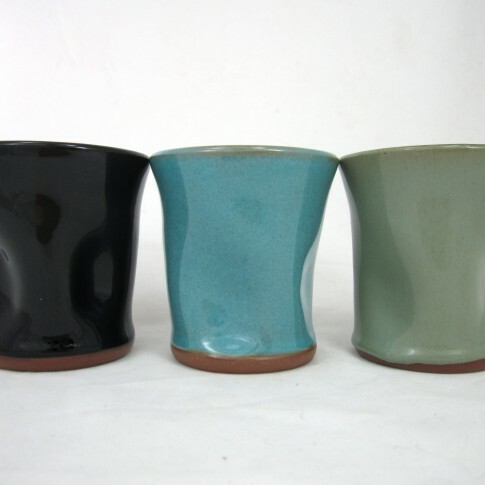 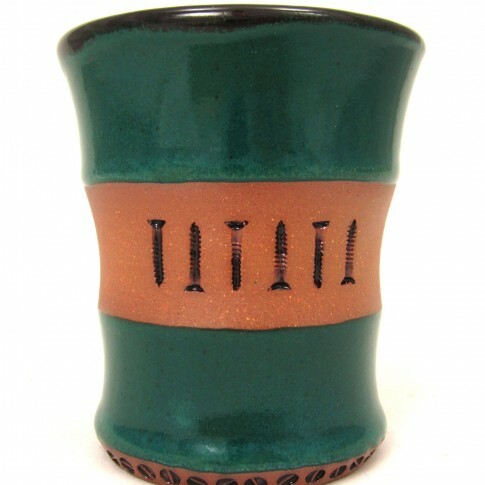 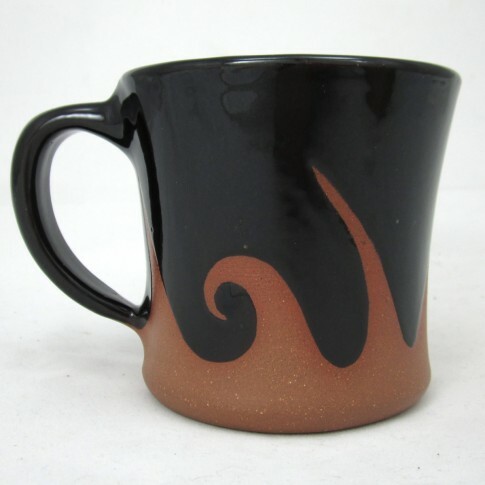 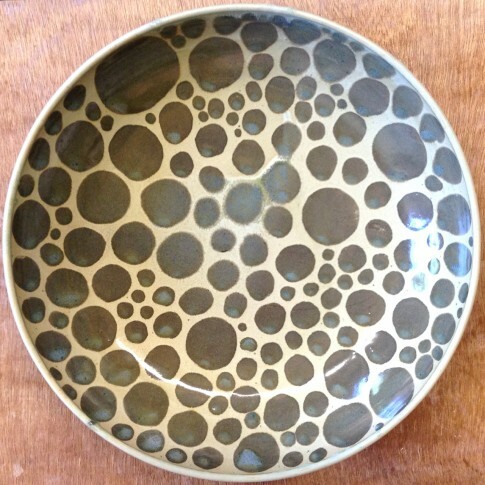 Available in a multitude of colors on bowls, mugs and vases. 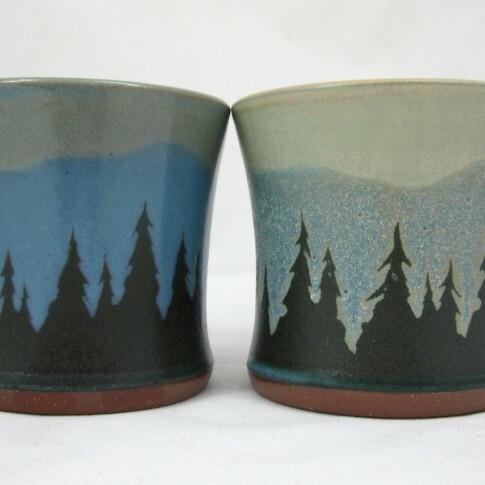 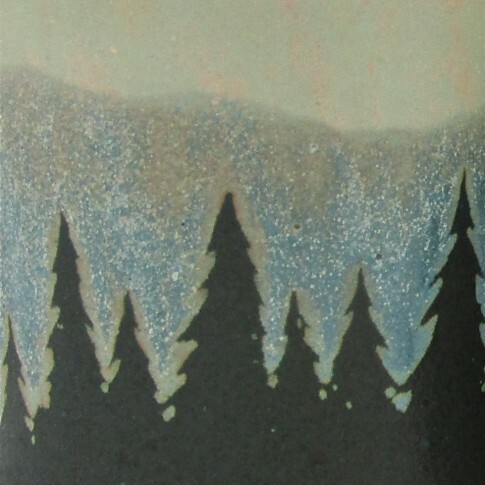 Handpainted evergreen trees, highlighted by textured glaze flashing, appears as falling snow, or as northern lights. 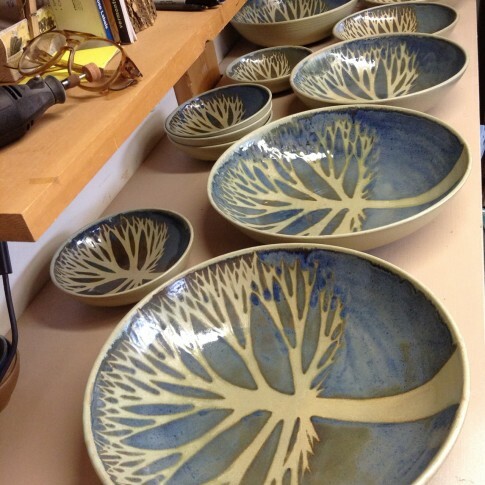 This is a collection of works in progress, or one of a kind pieces. 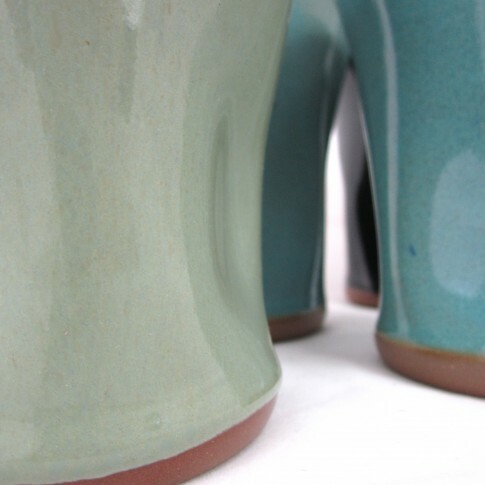 Feel free to enquire about availability. 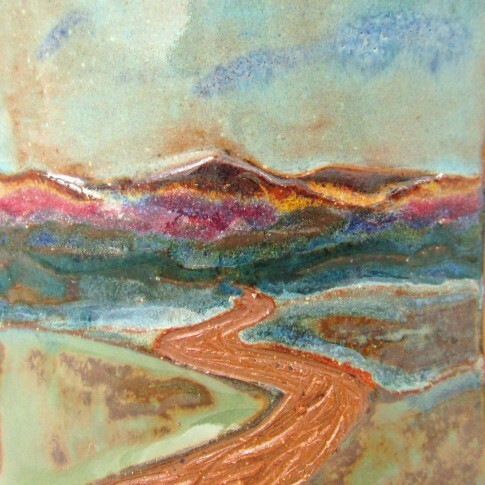 An earthen path meanders toward the brilliant, glassy mountains. 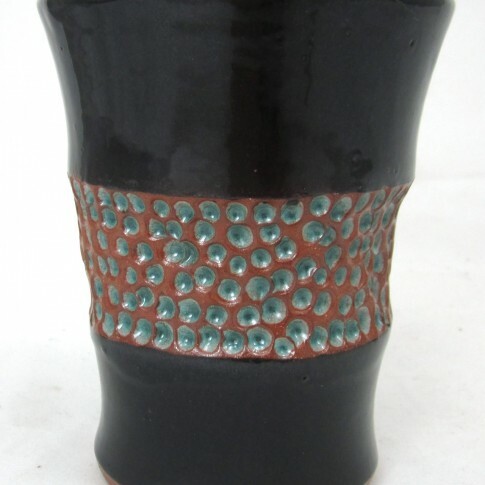 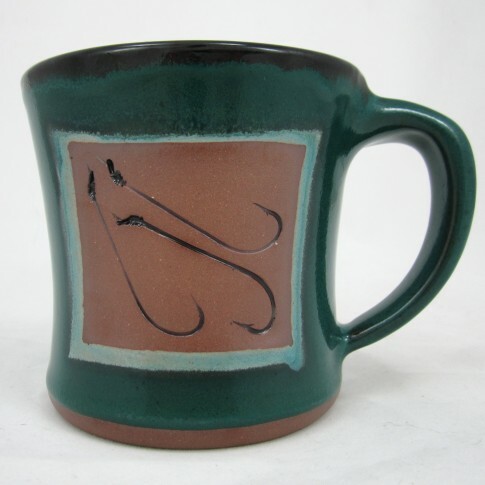 Available on mugs and vases in many colors and sizes. 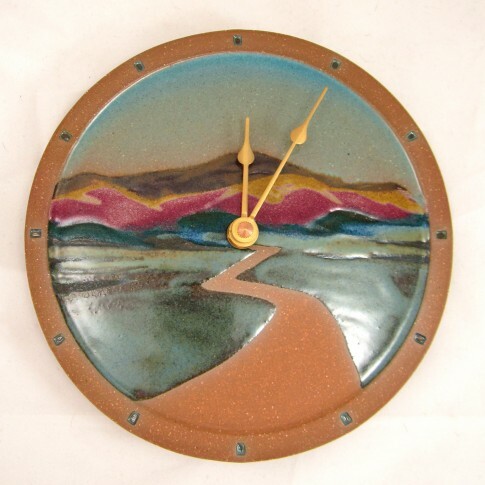 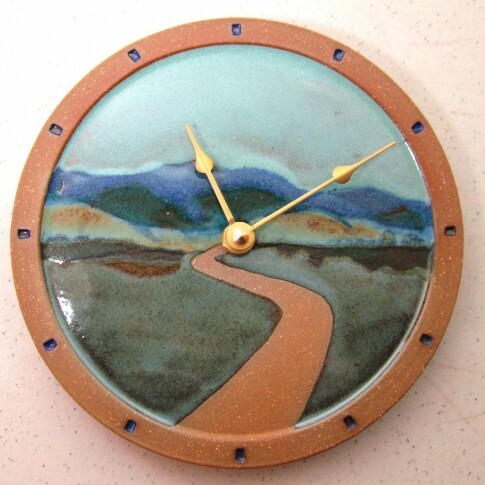 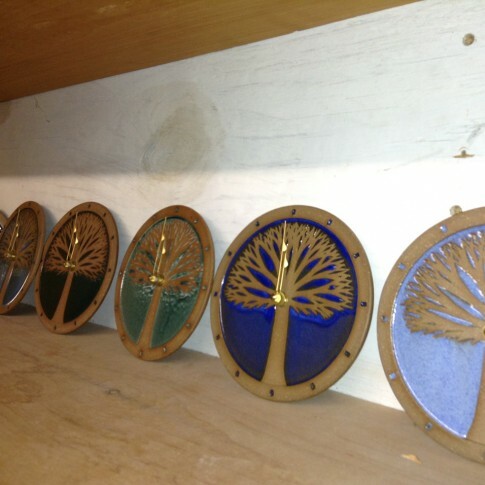 Tree and Landscape Clocks in many assorted colors. 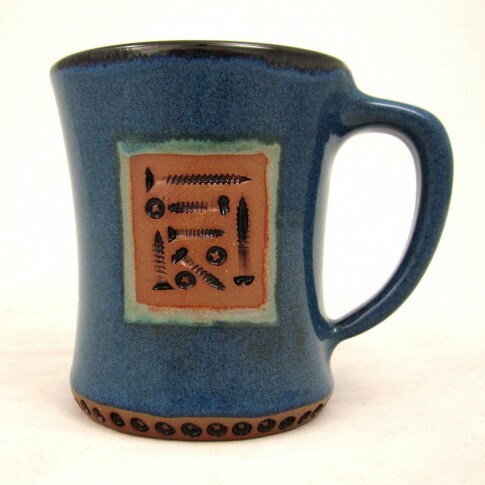 Needs one AA Battery. 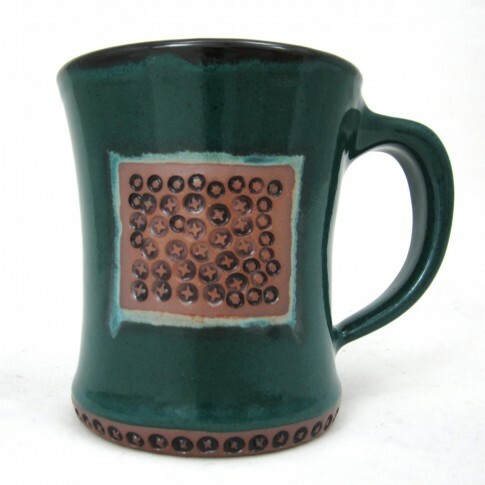 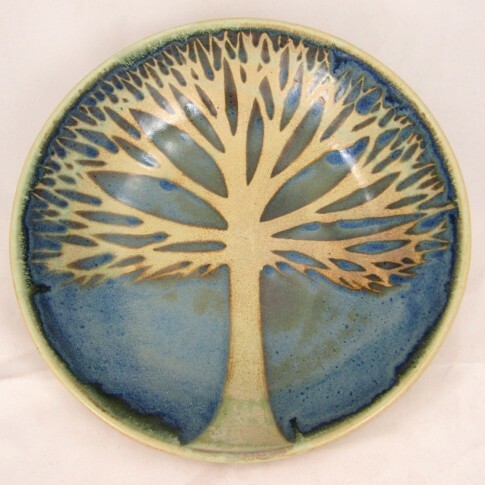 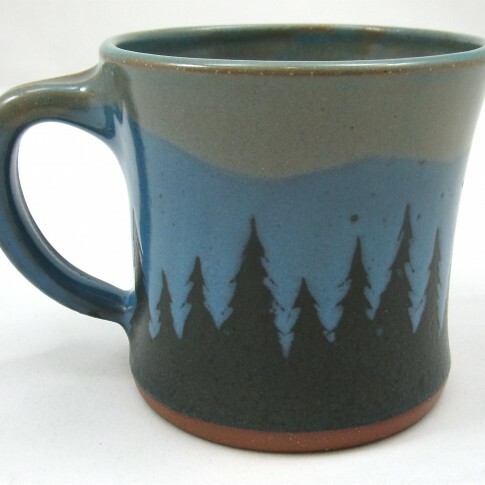 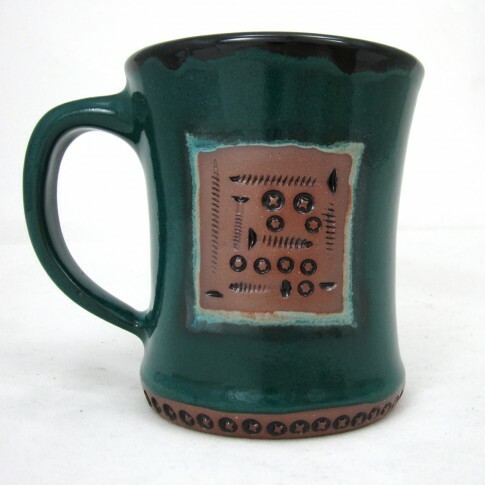 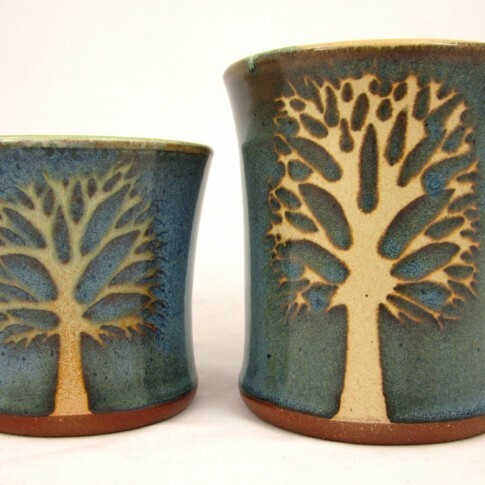 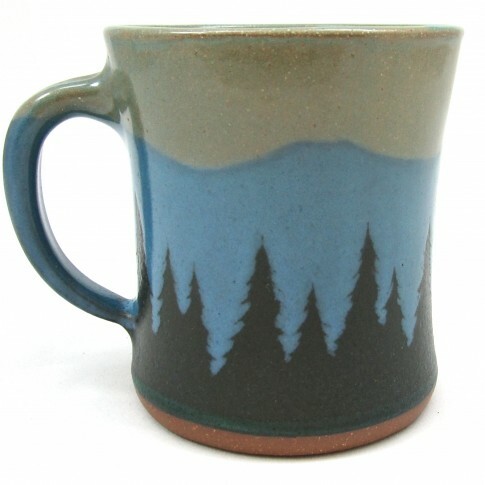 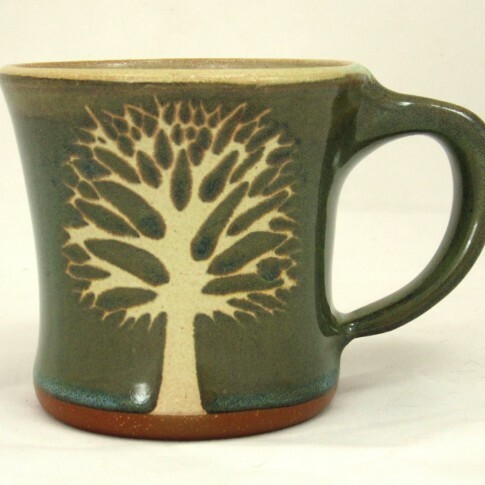 A collection of Green Tree Bowls and Mugs. 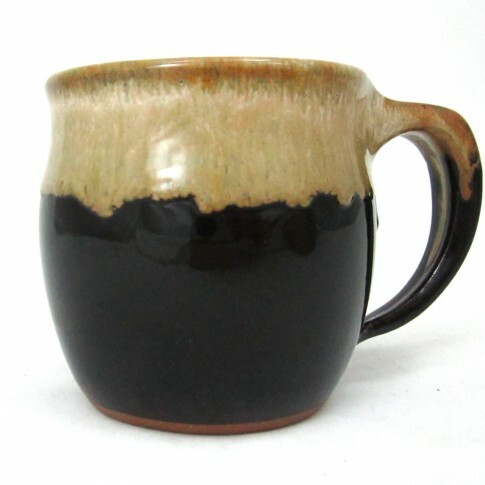 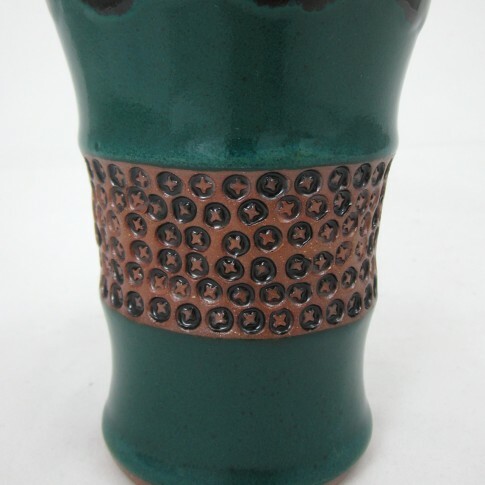 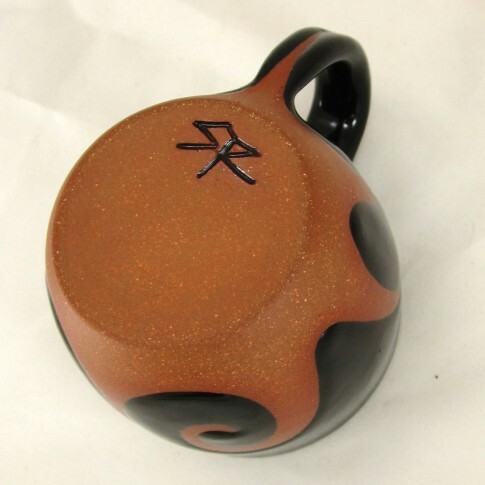 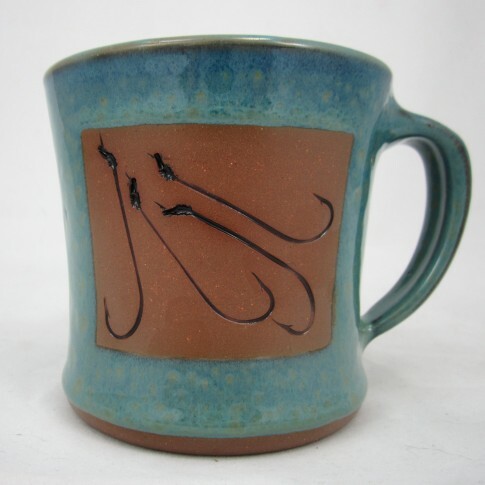 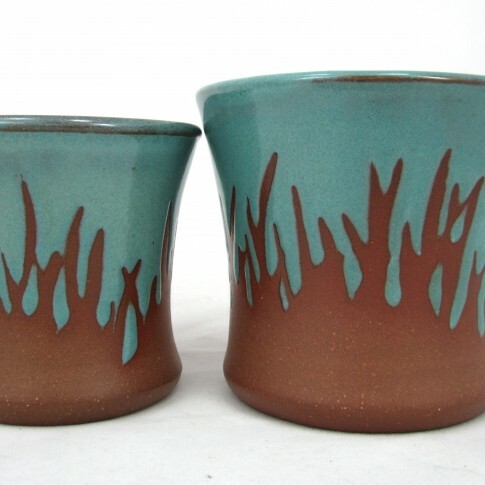 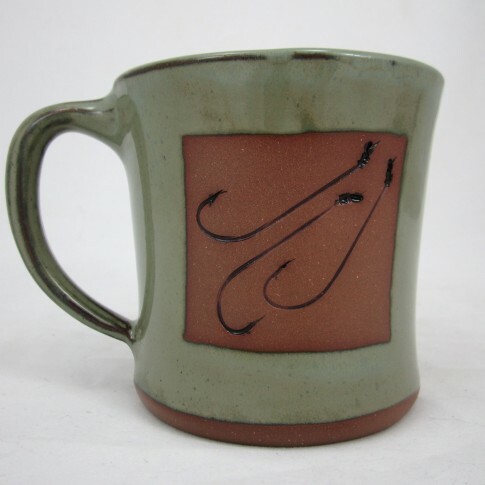 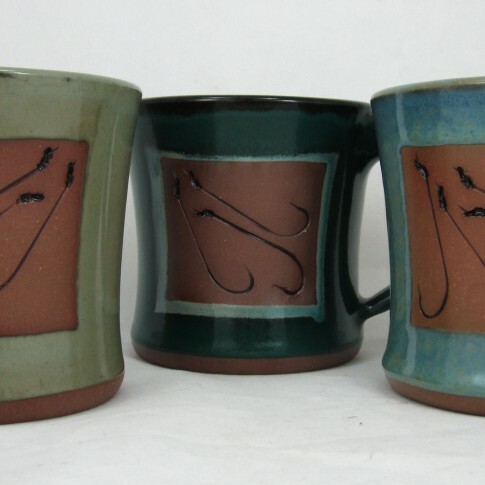 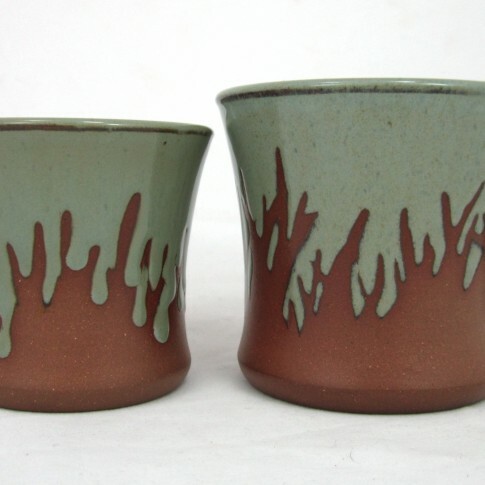 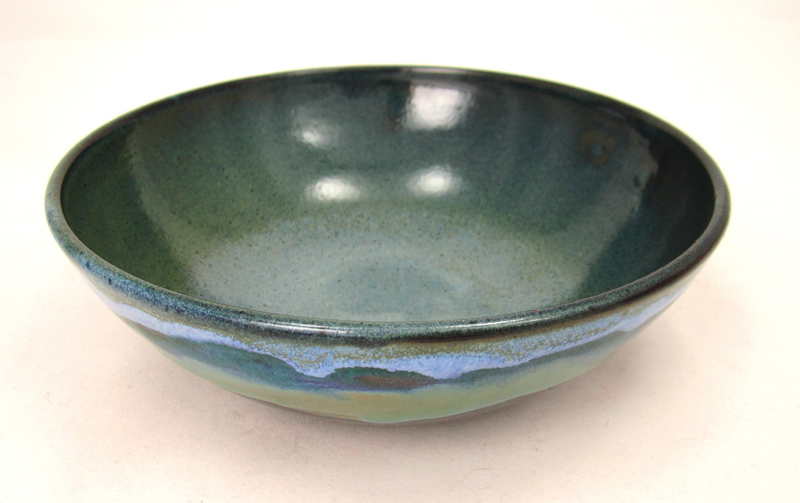 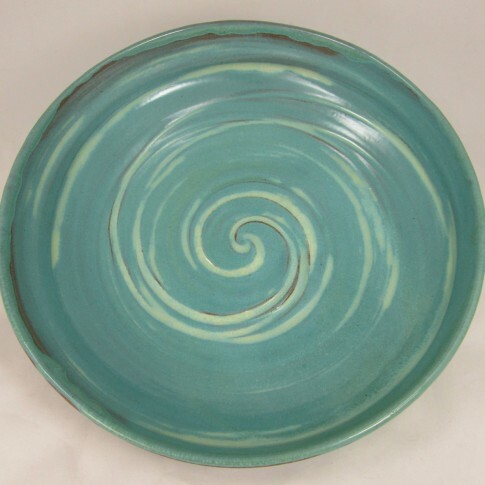 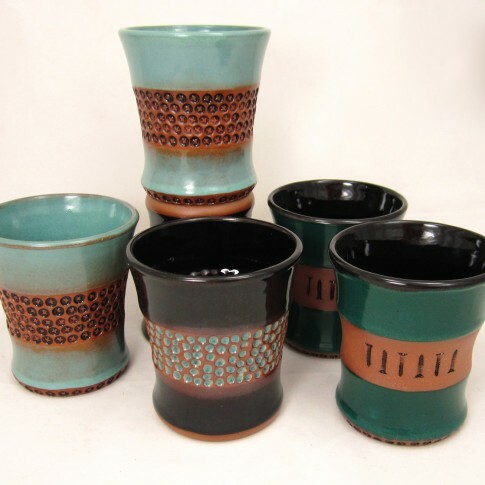 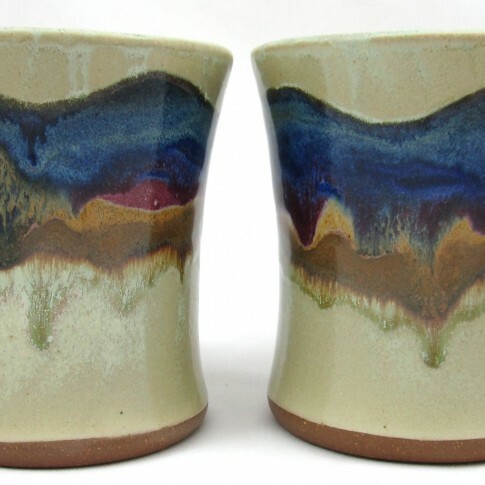 Each is a unique piece, due to glaze variations created in the heat of the firing, and the artistry of the brushwork. 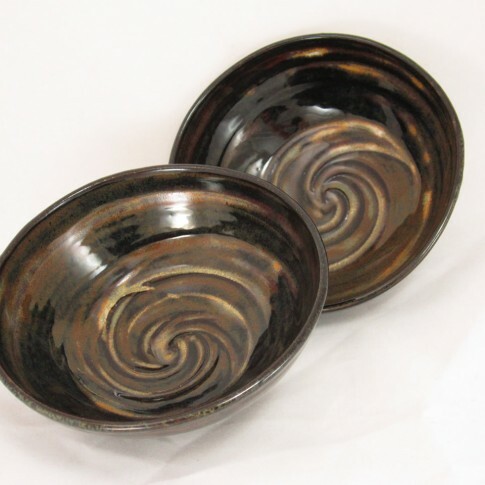 Raw, rough, red clay swirls in dynamic opposition to fluid, smooth, shiny color. 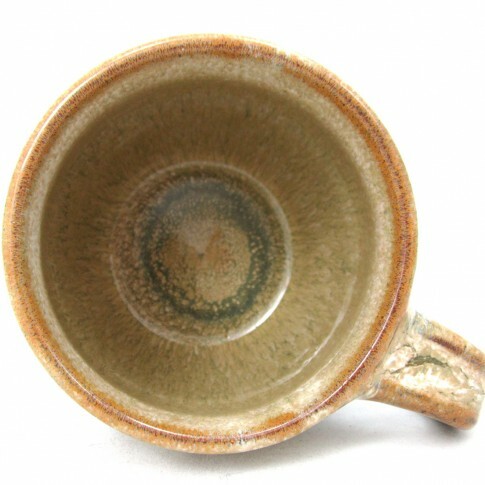 Available on mugs or bowls. 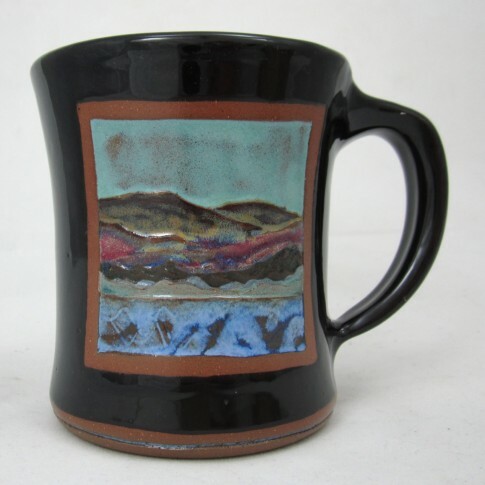 A melted mixture of pink, blue, and rust tones, layered upon a solid background. 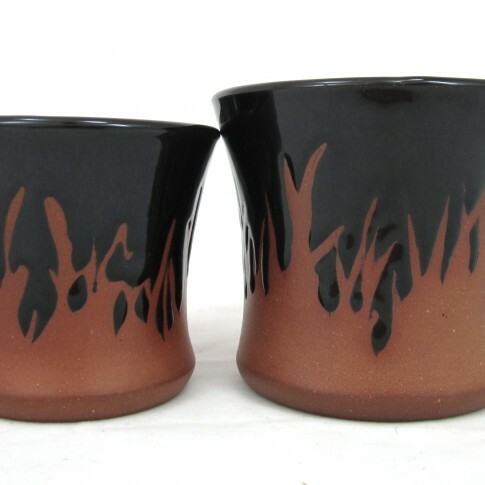 Available on mugs, bowls and vases. 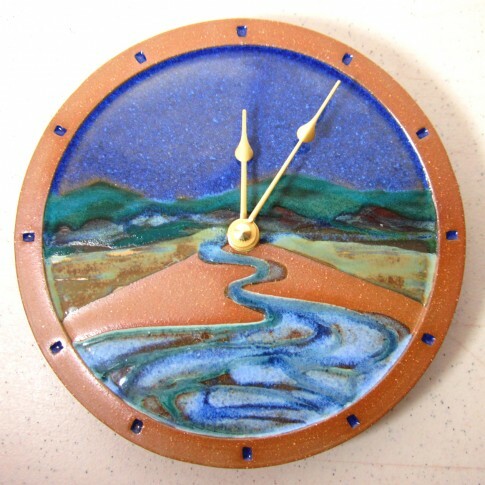 Handcarved reliefs laden in jewel-like glazes, reflect the seasonal landscapes of Vermont. 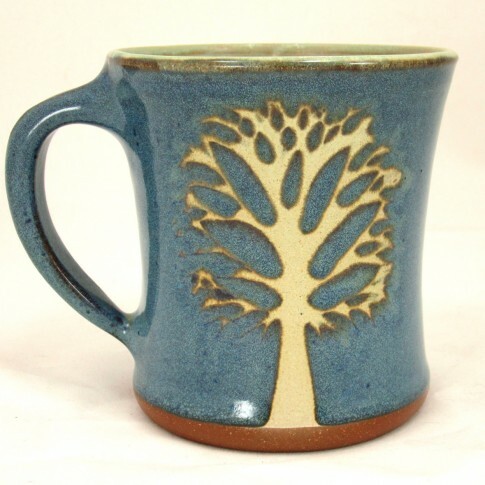 Available on Mugs in Yellow, Light Blue or Black. 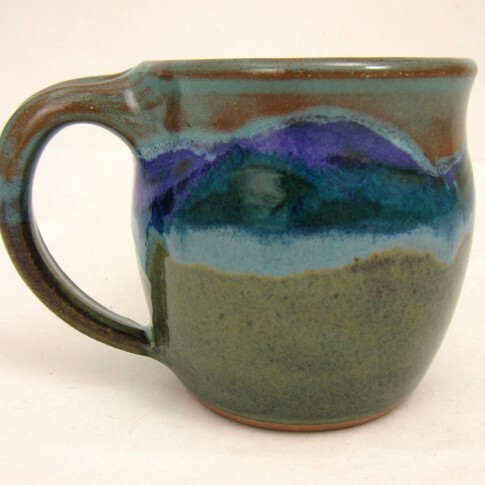 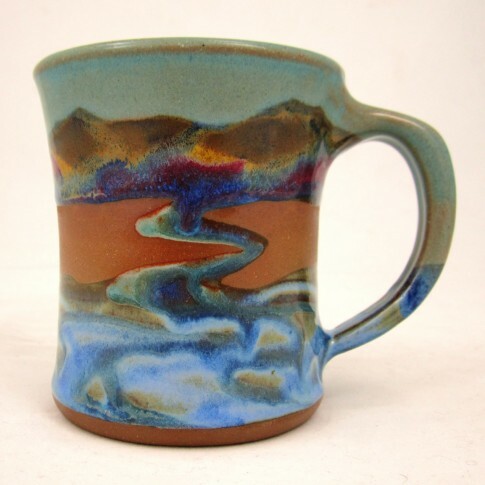 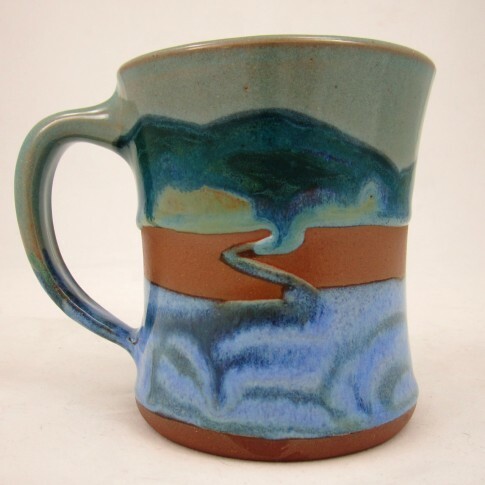 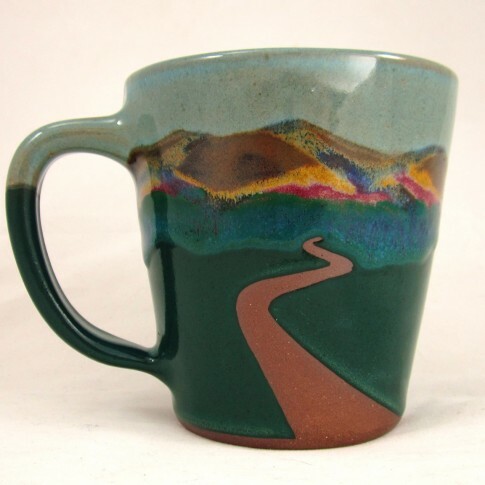 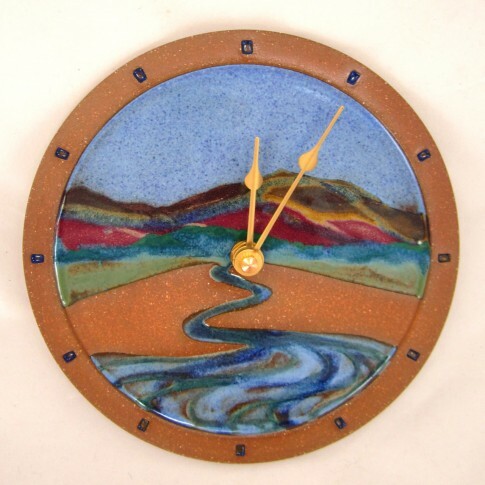 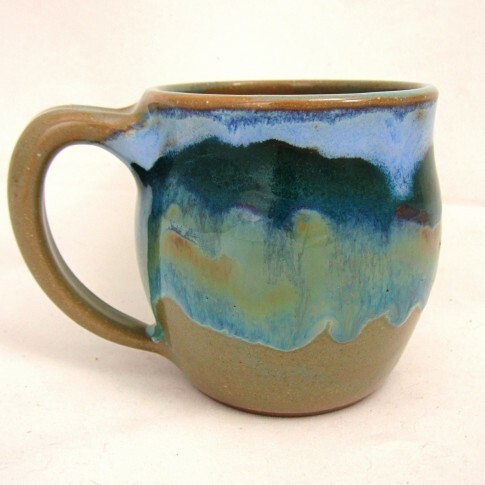 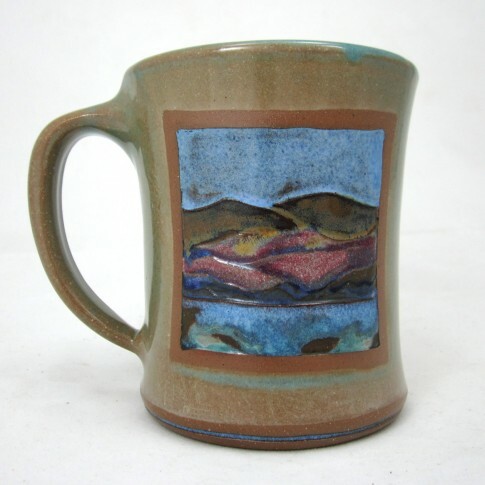 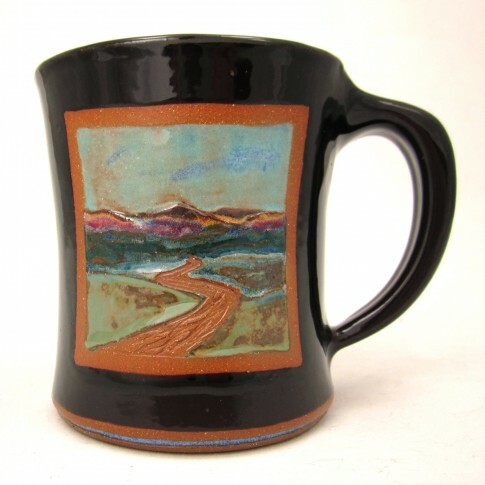 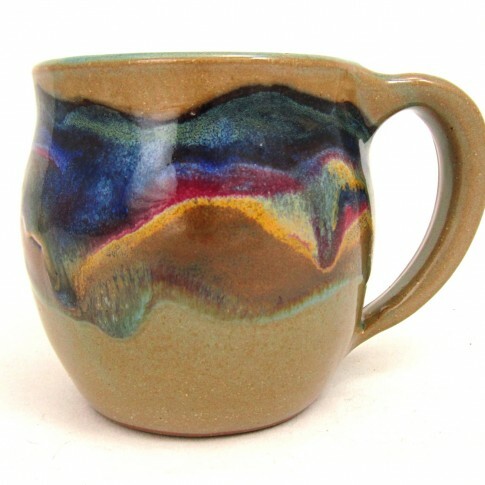 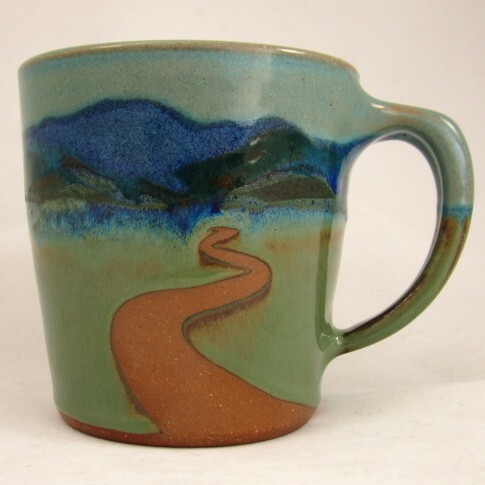 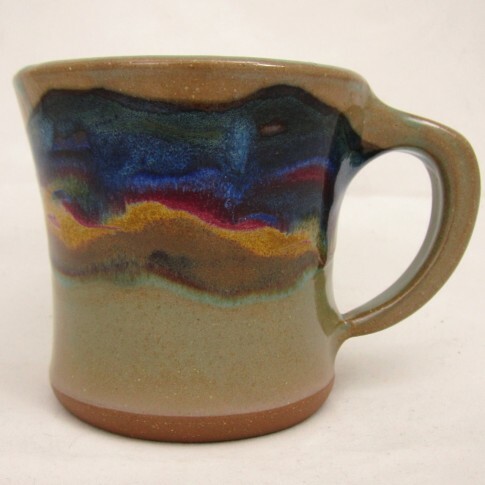 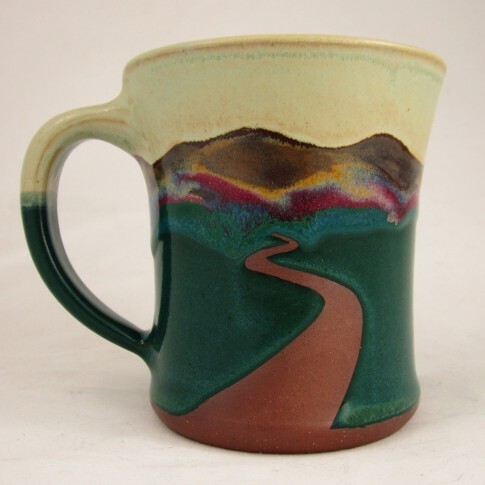 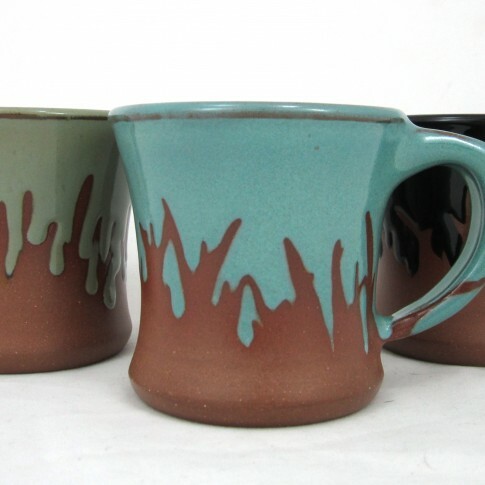 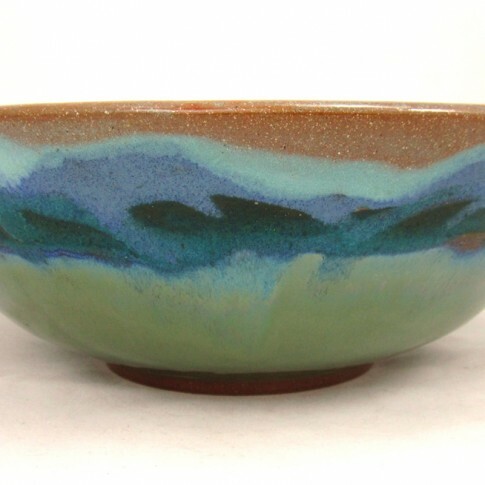 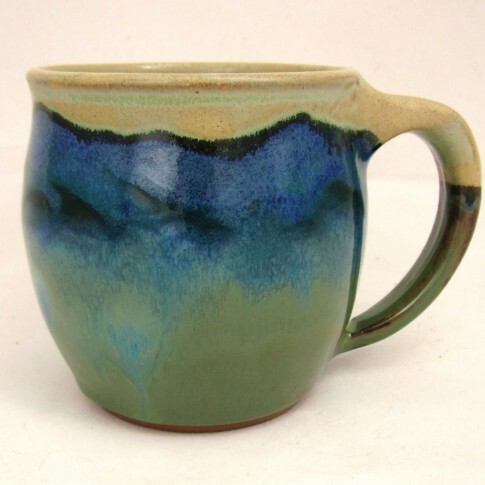 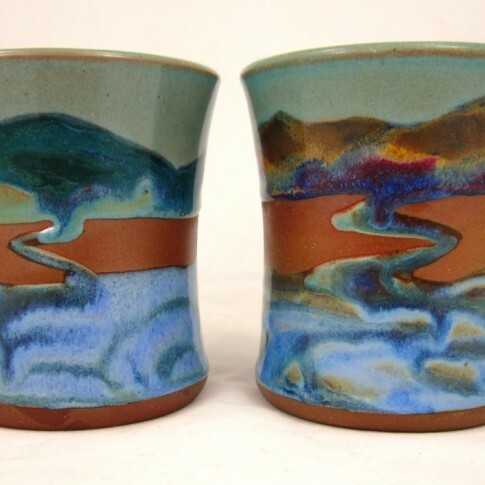 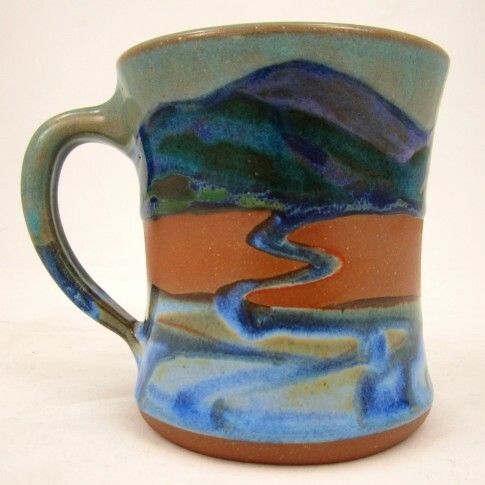 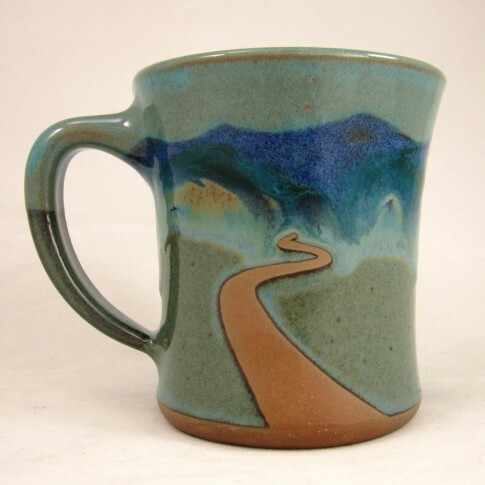 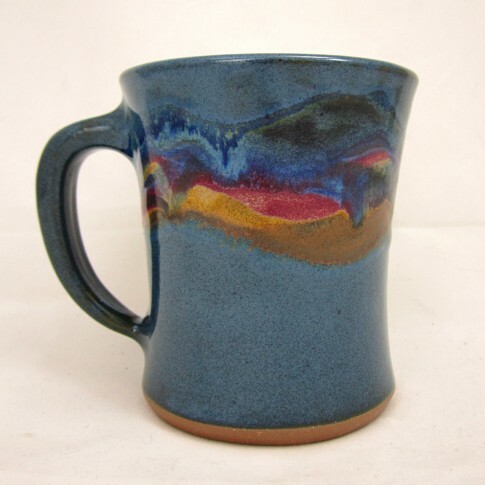 Colorful glazes flow like water across the rough clay in unique, melting landscapes. 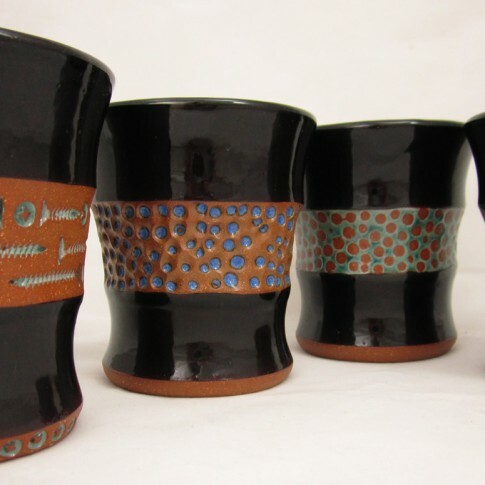 Available on mugs, bowls and vases. 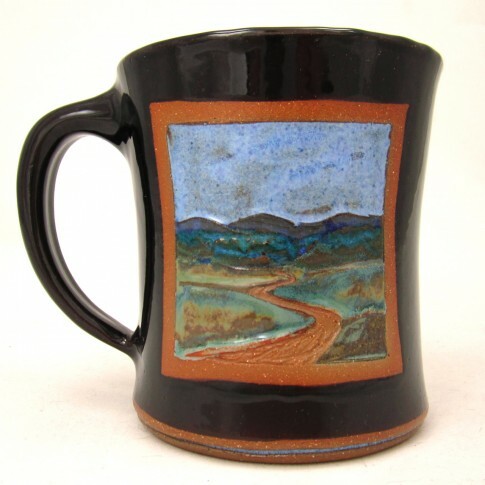 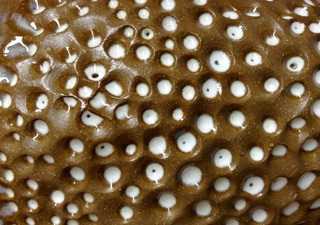 Screw impressions in raw red clay provide deep texture amidst rich glaze colors. 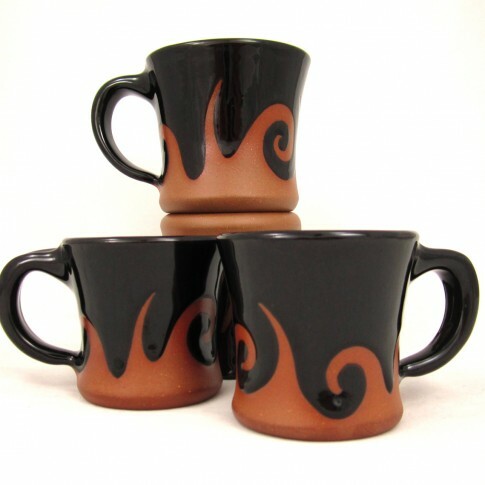 Available in a variety of unique styles. 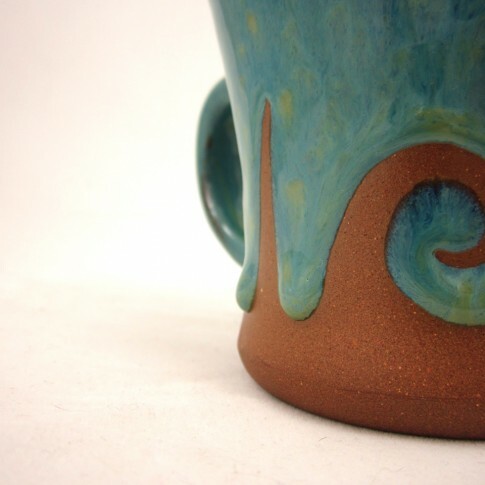 From my hand to yours....comfortable curves, cool colors and smooth surfaces.